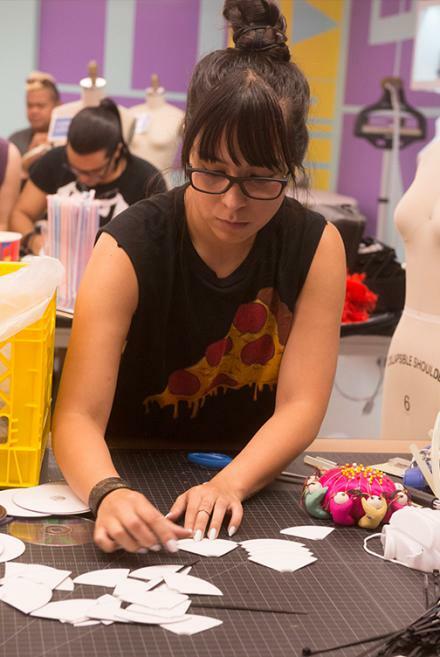 Project Runway Episode 2 Recap: Unconventional Challenge! 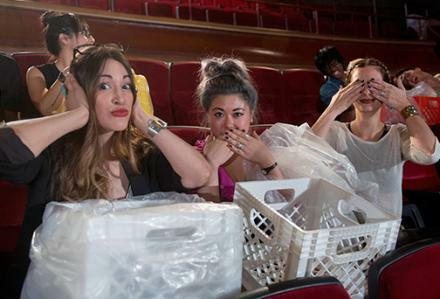 This week on Project Runway, the designers had an unconventional challenge! They woke up to a popcorn bucket on their hotel room kitchen counter with a letter from Tim and Heidi which said to go to the Village East Cinema for an early matinee. The designers are excited, because most think they are designing for a movie. Little do they know, they are going to have to collect movie props used in or for movies as their material. This is going to take a lot of creativity and a good eye for detail, since they aren’t working with fabric. Did I also mention that they’re working in teams? Well they are! 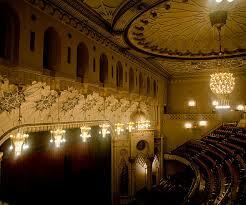 As the designers walk into the cinema, they are baffled by the beautiful ceiling in the Village East Cinema. 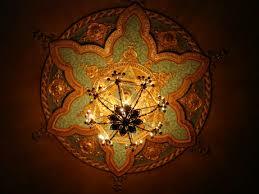 Which has a beautiful golden, rustic color with some blue and an amazing lit chandelier. 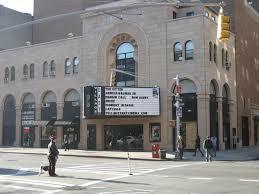 I would love to go to the movies there! The designers go into a room where they’re supposed to watch a movie about fashion, but the film burns out and Tim Gunn’s face appears! He explains that they are doing an unconventional challenge and that they will be working in groups of three! So the two people sitting next to a designer will be his/hers teamate. Most were sitting next to designers who had completly different asthetic designs. How stressful is that? 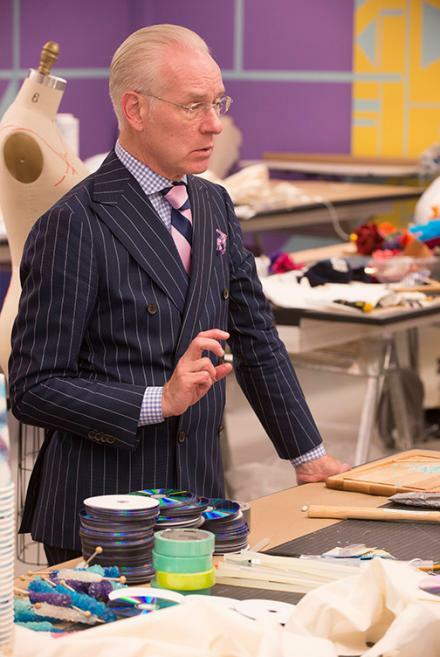 Once Tim Gunn was finished talking, all of the designers were given crates to carry their materials in. They all rushed to the tables that had their materials like it was a race! Most were pushing and shoving to get what they needed and I couldn’t blame them. First one there got the best pick and there was a variety to pick from! It varied from VHS film tape to nuts and bolts to speaker wires. They had to be really thoughtful and talk with their teamates so that everything was cohesive, but could still be a one of a kind. In the work room there was so much film, script papers, DVDs, and other materials all over the designers’ work stations. It looked really messy! Most of the designers were getting along with their groups and staying strong with their designs. It was nice seeing such a stressful situation being handled by calm attitudes. Later on, Tim came into the work room and gave his critique to the teams, and some didn’t handle it too well. The red team (Sandhya, Carrie, and Hernan) was struggling with bringing their designs together. They decided to make them very similar using film tape in all three outfits as well as use the same design for their pieces. The judges didn’t appreciate that. Emily working on her dress (top left). Samantha is measuring the DVDs to cut (top right). Sandhya is looking at the film tape (bottom left). Tim Gunn giving out advice (bottom right). When it came time for the runway there were many outfits that had me in awe. Emily used cut up DVD’s for the upper body and film tape for the dress part of the outfit. Angela’s design was a white dress with a black and white trail of cut up movie scripts. Dramatic, but still too safe. Char used pieces of broken up DVDs and movie admission tickets to create a blue and pink dress with a little sparkle from the DVDs. Each design was beautiful in its own way, but as always we have losers and winners. The losing team was Sandhya, Carrie, and Hernan. I could see why the judges didn’t like their outfits, because they used film tape for all three and didn’t do anything special to the outfits. The winning team was Korina, Kristine, and Amanda. They used letters, color (green), cords, bolts and nuts, and even straws! All three designs were original and had something cohesive. I was incredibly happy when that team won! When the winning and losing teams were picked there was still a loser and a winner that had to be picked from the teams. Since Amanda’s dress was flowing, had color, energy, and was a strong design overall, she won! Carrie’s design was bland and since Sandhya had immunity for this challenge, she was out. I wish the designers luck and expect great things from them next week!